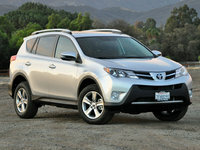 CarGurus has 30,476 nationwide 4Runner listings starting at $2,200. My husband loves the Toyota 4Runner. He would go out and buy one in a heartbeat if I let him. He’s not an outdoorsy fellow, though. And I’m never going to agree that a 4Runner is a good family vehicle. 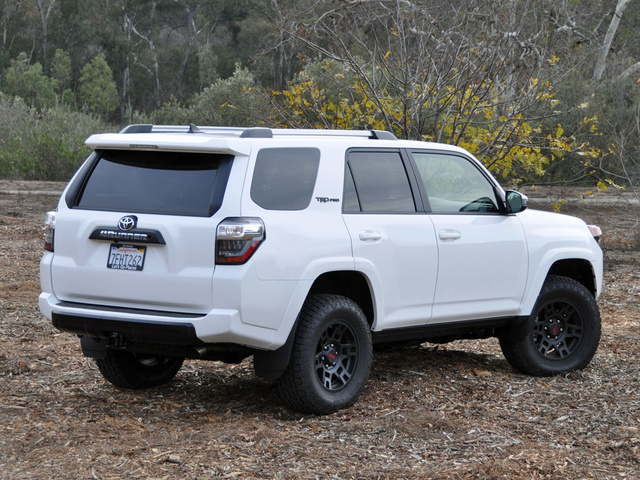 The 2015 Toyota 4Runner TRD Pro is built for hard-core off-road enthusiasts. In conquering rock-strewn paths, it excels. And it’s great at carrying lots of stuff. But as a day-to-day runabout for ferrying little kids, there are too many compromises. That is exactly what my daughter whined when she first spotted the 2015 Toyota 4Runner TRD Pro in our driveway. No, my dear, they didn’t think of the children. Rather, they thought of the hard-core boulder bashers, the ones that take the greatest of pleasure on the most precipitous of trails. This genuine SUV is for the take-no-prisoners kind of adventurer who scoffs at step rails, viewing them as hindrances to mobility rather than as requirements for clambering aboard this high-riding rig. You see, even in its purest form, the Toyota 4Runner is not one of those wannabe crossover vehicles that looks a little bit like a truck but sits on a domesticated car platform. Instead, the 4Runner is a true, classic, body-on-frame SUV with 9.6 inches of ground clearance and, especially in TRD Pro form, bristling with toughened parts designed to get you to your destination, no matter where that is, nor how brutal the terrain along the way. 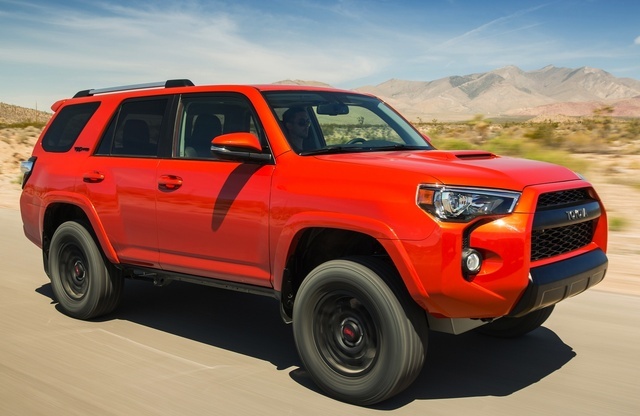 Toyota offers the 2015 4Runner in four flavors: SR5, Trail, TRD Pro and Limited. The base SR5 is equipped with rear-wheel drive, defeating the purpose of buying one in the first place. Aside from an upgrade to part-time 4-wheel drive with Downhill Assist Control, the 4Runner SR5 comes with everything you really need, unless you think you need the optional Premium Package. That adds an upgraded infotainment system with a high-resolution screen, navigation, premium sound and Toyota’s Entune App Suite smartphone integration technology. SofTex leatherette upholstery is also included, along with an 8-way power driver’s seat, heated front seats, heated side mirrors and a power sunroof. 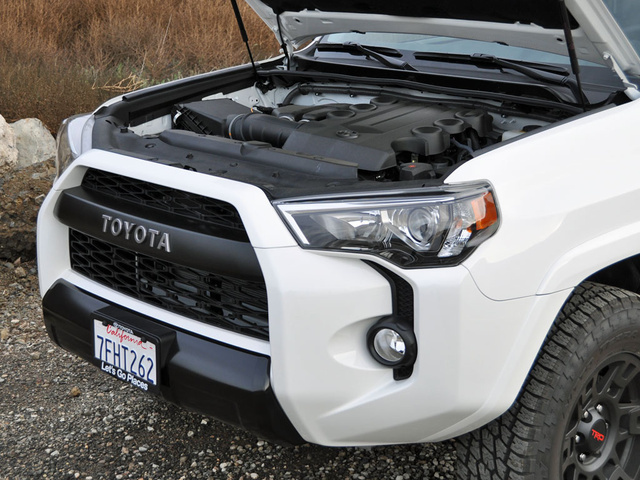 The 4Runner Trail trim level is similar to the SR5 in terms of appearance, but has a different wheel style, a hood scoop and a brawny simulated front skid plate to signify the serious hardware lurking within. The list of upgrades includes standard 4WD, a locking rear differential, selectable driving modes matched to the terrain, a crawl control system for managing power in tough spots and Downhill Assist Control to manage speed on steep descents. A Premium Package is optional for the 4Runner Trail, and a Kinetic Dynamic Suspension System (KDSS) is exclusive to this model, disconnecting the SUV's stabilizer bars to improve suspension articulation during low-speed crawls over difficult terrain. Luxury is the name of the game with the 4Runner Limited. Leather seats are ventilated up front, and the Limited adds dual-zone automatic climate control, a 15-speaker JBL audio system, keyless entry with push-button engine start, front and rear parking sensors, and Toyota’s Safety Connect services. This version remains capable, though, equipped with a full-time 4WD system, a locking center differential and adaptive roll-reducing suspension dampers (X-REAS) for a more comfortable ride and secure handling. The Limited’s attractive 20-inch aluminum wheels might not be ideal once the pavement ends, though. Most 4Runner buyers opt for either a third-row seat or a sliding rear cargo floor that can support up to 440 pounds and is perfect for tailgate parties. My test vehicle for the week, the new-for-2015 Toyota Racing Development (TRD) Pro model, contained neither of them but did have carpeted floor and cargo mats, bumping the price tag by $225 to $42,420, including the destination charge of $885. Mixing and matching SR5 and Trail equipment, the new 4Runner TRD Pro boasts the same drivetrain upgrades as the Trail combined with TRD Bilstein high-performance shocks with rear remote reservoirs, TRD front springs, a TRD aluminum front skid plate and matte-black 17-inch aluminum wheels wrapped in beefy off-road tires. Aggressive front styling, unique detailing and a higher ride height are standard, and my little girl would be pleased to know that running boards are an option. With its matte black exterior accents highlighted by the Super White paint job, my 4Runner TRD Pro is a rather ugly and menacing SUV, but one that looks purposeful and kind of kickass. It isn’t as flagrantly in your face as something like a Ford Raptor, but with no more than a glance, the other mommies in the elementary school pick-up line knew that this was no mere suburban surrey. My husband loves the 4Runner. He would go out and buy one in a heartbeat if I agreed that this would make a good family hauler. However antiquated this might seem, the 4Runner gives him a notion of masculinity while tooling around our corner of suburban Los Angeles, driving an authentic truck rather than the meeker crossovers that are so common—and which we own. From behind the wheel of a 4Runner, windows down, sunroof open, music blaring, he dreams of shedding his practical responsibilities in order to conquer the wildernesses like a burly mountain man. Seriously though, he’s not an outdoorsy fellow. He only appreciates pristine, panoramic vistas if he knows he can go back to a hotel room stocked with pricey single-malt whiskey and high-thread-count linens. And I’m never going to agree that a 4Runner is a good family vehicle. Yes, it’s nice to know that you can, if necessary, traverse intimidating terrain. But this 4Runner is impractical for daily driving on many fronts aside from the one my daughter immediately identified. The engine, Toyota’s tried-and-true 4.0-liter V6, makes 270 horsepower and 278 lb-ft of torque and feels perfectly adequate for most situations, but doesn’t raise any pulses. It needs more pep and spirit, especially considering that the 5-speed automatic transmission takes a while to kick down when you want extra oomph for passing. Fuel economy is expectedly dismal; the EPA says I should have gotten 18 mpg in combined driving. Instead, I managed 16.8 mpg, and that reflects plenty of time spent cruising on the highway. As a daily driver in the real world, the 4Runner TRD Pro rides hard and feels tall, and you’re acutely aware of how a high center of gravity and the laws of physics discourage sudden changes of direction. Not that such maneuvering is easy to execute in the first place. The steering is slow, the turning circle is wide, and the brakes are numb and unresponsive until they suddenly grab with an unexpected force. Where the 4Runner TRD Pro excels is off the beaten path. Out where the landscape exists independent of human design, the 4Runner TRD Pro runs free and demonstrates its true spirit. Heavy rainstorms made mountain slides likely and off-roading treacherous, so I tackled mud instead. 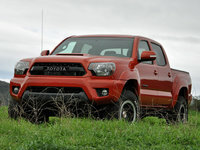 With the 4WD system engaged, the TRD Pro effortlessly churned through the muck, and I didn’t even have to engage 4-Lo. Despite widely held public opinion otherwise, Southern California is loaded with imperfect pavement, and it was on these stretches of city streets where I most appreciated the TRD Pro’s upgraded suspension and all-terrain tires. The 4Runner soaked up bumps, cracks, holes and undulations like they didn’t exist. More than anything else, this was my favorite thing about driving it. 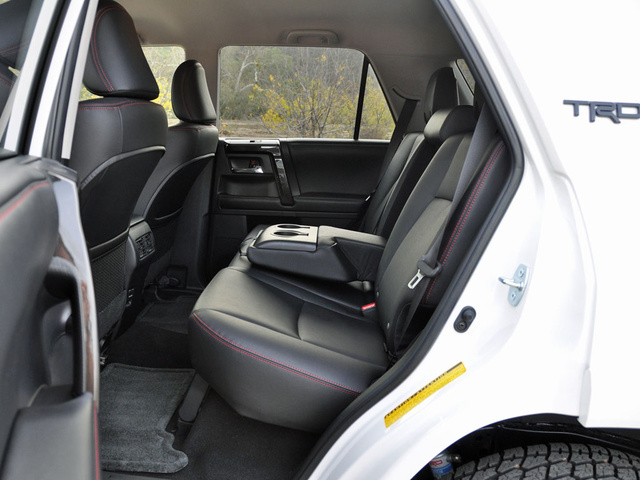 Toyota put plenty of thought into the 4Runner’s cargo and storage space, and this SUV delivers a roomy 47.2 cubic feet of space behind the rear seat. Fold it down and you’ve got 89.7 cubes of volume with which to play. Order the optional third-row seat or the sliding cargo tray, and the numbers drop to 46.3 and 88.8 cubic feet respectively. To put this into perspective, the 4Runner supplies nearly as much cargo space as a Chevy Tahoe. There’s a 3-prong, 120-volt, 100W/400W power outlet back there, too, along with myriad tie-down cleats and storage cubbies to keep all your gear secured. One feature that separates the 4Runner from other midsize SUVs is its power rear window, which slides down into the tailgate. Open all the windows, power open the sunroof, and let the fresh air rush through the cabin. My husband, who has owned a convertible for the past 20 years, loves this feature. The more carefully coiffed may not. 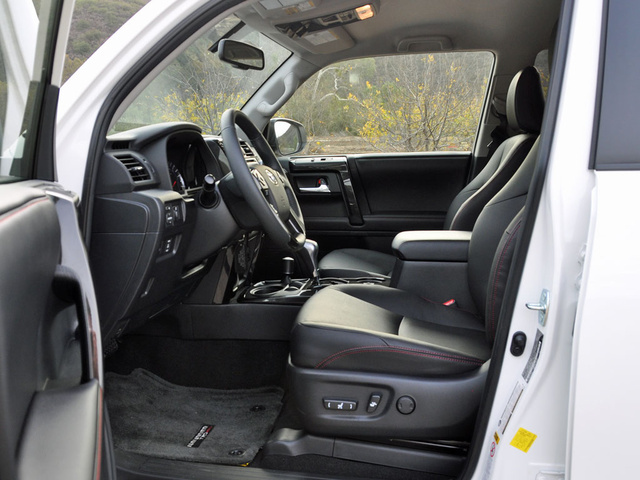 Once you’re able to climb inside the 4Runner TRD Pro, which is no easy feat for those shorter of stature or with mobility issues (my mother would never be able to get aboard), no luxury is to be found. Putting function before form, the materials are hard and unyielding, making the interior easy to clean and more durable. Comfort levels are impressive, though the SofTex leatherette doesn’t breathe well, and a sweaty backside is likely even on milder sunny days. I’d trade for cloth, or suggest that Toyota install ventilated seats. There is no seat-height adjuster for the front passenger seat, but we didn’t mind in this particular vehicle. Rear seat occupants will find plenty of room in all directions, along with reclining seat backs and excellent outward visibility. 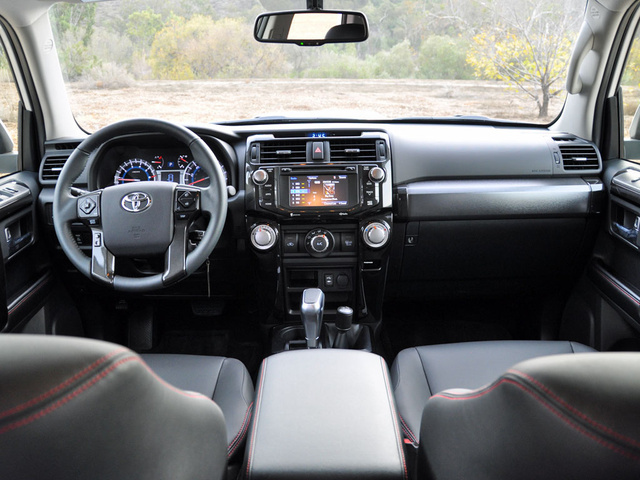 A touchscreen infotainment system is standard in the 4Runner TRD Pro Series, equipped with a 6.1-inch display screen, navigation, upgraded stereo speakers and Entune App Suite smartphone connectivity. Predictive traffic and weather features are nice to have, as is the USB 2.0 port for faster device charging. But what I really wanted was the bigger 7-inch screen that is exclusive to the 4Runner Limited model. I found it easy enough to connect my phone to the system, but small touch-sensitive buttons combined with TRD suspension tuning and occasional sun glare made this setup difficult to use with a minimum of distraction. If the infotainment system’s interface was disappointing, the 4Runner’s available off-roading technologies are impressive. Most versions have a part-time 4WD system as standard or optional equipment, while the Limited model includes a full-time 4WD system with a locking limited-slip center differential. Every 4Runner gets a Hill Start Assist Control system, and models equipped with 4WD include Active Traction Control and Downhill Assist Control. Choose the 4Runner Trail for technology that will help you get through the rougher stuff. This model has a Multi-terrain Select system with four different driving modes designed to improve traction on specific kinds of driving surfaces, as well as Crawl Control technology that automatically manages acceleration and braking for the driver while he or she steers around or over obstacles at low speeds. It works going up hills, down hills, around sharp kinks in a trail, wherever. A Kinetic Dynamic Suspension System (KDSS) is exclusively available for the 4Runner Trail model, disconnecting the suspension stabilizer bars to increase wheel travel and articulation. This setup is not included for the TRD Pro Series, because it gets unique Bilstein high-performance shocks with remote rear reservoirs, as well as specific TRD front springs. Perhaps the Entune infotainment system isn’t terribly remarkable. The rest of the hardware that goes into a 4Runner certainly is. Aside from a standard reversing camera, the 4Runner offers few of the latest active safety features. I especially missed having a blind-spot monitoring system, as the 4Runner’s high center of gravity makes it more susceptible to rolling over if you’re forced to take sudden evasive action, so make sure you adjust the side mirrors to give you the best possible view of adjacent lanes of traffic. More irritating is how Toyota reserves its Safety Connect service technology for only top-of-the-line models. With an active subscription to Safety Connect, available only for the 4Runner Limited, an emergency services operator can assist you after a collision or if you need help for another reason. Competing automakers offer similar technology, sometimes as standard equipment. That’s not why I won’t let my husband run out and get a 4Runner, though. Instead, I’m unimpressed with this SUV’s crash-test and rollover-resistance ratings, which means I can’t recommend the 4Runner as a family vehicle. Overlook the 4Runner’s crash-test ratings and its mediocre gas mileage, and it starts to make sense again. Remember how I said this Toyota is almost as big inside as a Chevy Tahoe? Now consider that a loaded 4Runner Limited with all the trimmings has a lower sticker price than a Tahoe base model with rear-wheel drive and no extras. Plus, maintenance is free for the first two years or 25,000 miles of 4Runner ownership, and ALG gives this SUV its top depreciation rating, indicating that it will hold its value over time. Add impressive reliability ratings from Consumer Reports and J.D. Power, and a 4Runner appears to be a great value for people who need an SUV that can go places other vehicles can’t. 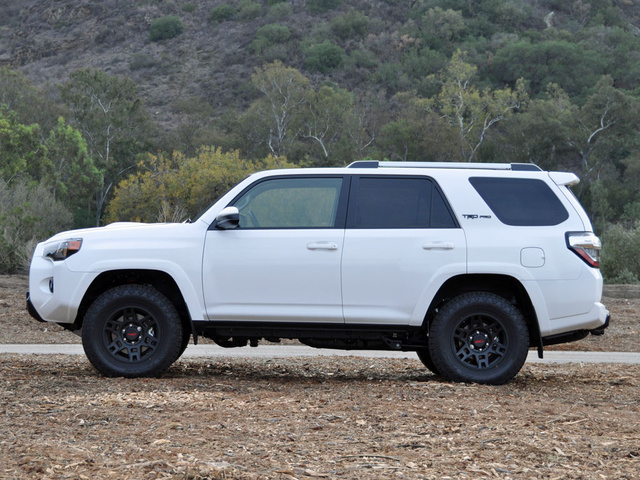 What's your take on the 2015 Toyota 4Runner? 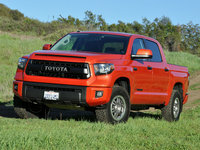 Xccat Wow, the truck looks great in the TRD Pro trim, I have not been this exicited about a car in ages! Good job to the design team for making it obvious to the civilized world that this thing is the embodiment of the original concept showing off what an SUV with dinosaur DNA looks like. TonySos Good review. Overall, I find the 4Runner to be a unique vehicle that had masculinity and style that appeals to both men and women. The quality and reputation for reliability continues to make this vehicle a standout in many respects including resale value and plain old fun. You can't go wrong with 4Runner. 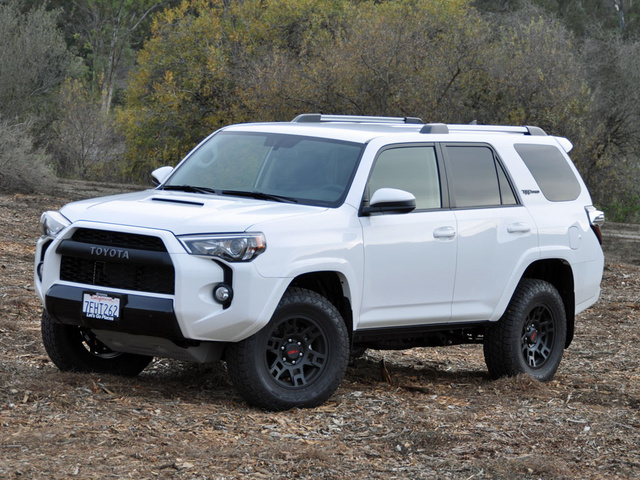 Users ranked 2015 Toyota 4Runner against other cars which they drove/owned. Each ranking was based on 9 categories. Here is the summary of top rankings. Have you driven a 2015 Toyota 4Runner? WHY ARE THERE SO FEW USED TOYOTA''S WITH TOW PACKAGE? Benefits Of Leasing. Can I Get A Lower Monthly Payment Vs Buying?